The Page 99 Test: Mary Patrice Erdmans and Timothy Black's "On Becoming a Teen Mom"
Mary Patrice Erdmans and Timothy Black's "On Becoming a Teen Mom"
Mary Patrice Erdmans is Associate Professor of Sociology at Case Western Reserve University. She is the author of Opposite Poles: Immigrants and Ethnics in Polish Chicago, 1976-1990 and The Grasinski Girls: The Choices They Had and the Choices They Made. Timothy Black is Associate Professor of Sociology and Faculty Associate of the Social Justice Institute at Case Western Reserve University. He is the author of When a Heart Turns Rock Solid: The Lives of Three Puerto Rican Brothers on and off the Streets. “…requires breaking the silence.” These are the first four words on page 99 and while they refer specifically in this chapter to the silence surrounding child sexual abuse it is an appropriate metaphor for what we are trying to do in this book based on 108 life stories of teen mothers. By telling the backstory to their early pregnancies, we break the silence that dominates the narratives about teen mothers, narratives that shame teen mothers and blame them for such things as the breakdown of the traditional family, urban decay, bloated government spending, and increased incarceration rates. Most studies looking at the consequences of early childbearing find that teen mothers are more likely to use state assistance, to not graduate from high school, and to be single parents. What these studies remain silent about is the reality that teen mothers are more likely to live in impoverished neighborhoods, to attend inadequate schools, and to suffer the indignities of gender violence long before they become pregnant. And yet – policy makers, media pundits, and even some social scientists blame teen mothers for larger social problems inflicted on them, not caused by them. 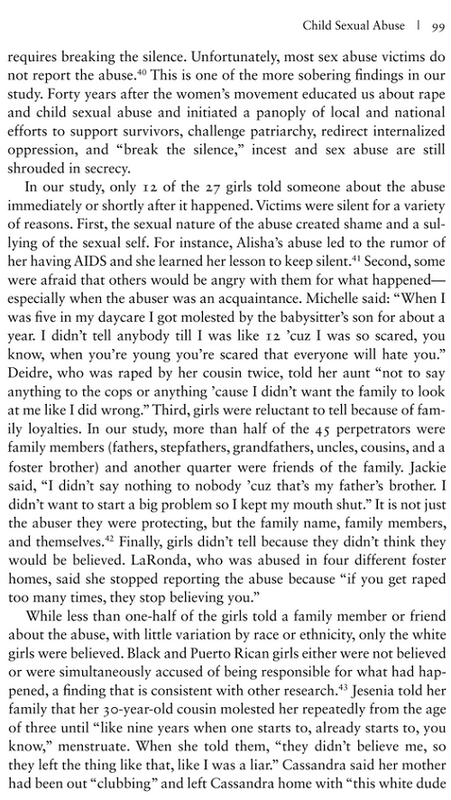 Page 99 [inset left, click to enlarge] is in the chapter “What They Tell You To Forget.” The relation between child sexual abuse and early childbearing was one of our sobering findings. Over one-quarter of the teen mothers in our study had been raped or molested when they were children, and most of them did not tell anyone about the abuse while it was happening. Despite 40 years of activism to reduce violence against women, sexual assault continues, not only in homes, but also on college campuses, in the military, and by prominent sports figures. While some adult women are speaking out, many teenagers and children are still hiding the abuse, and institutions are still trying to cover it up. In this book we expose the violence – structural, symbolic, and interpersonal -- that is caused by economic inequality, gender disparity, and persistent racism. It is time to break the silence; we must not forget that teen mothers are not “the problem," social injustice is the problem. 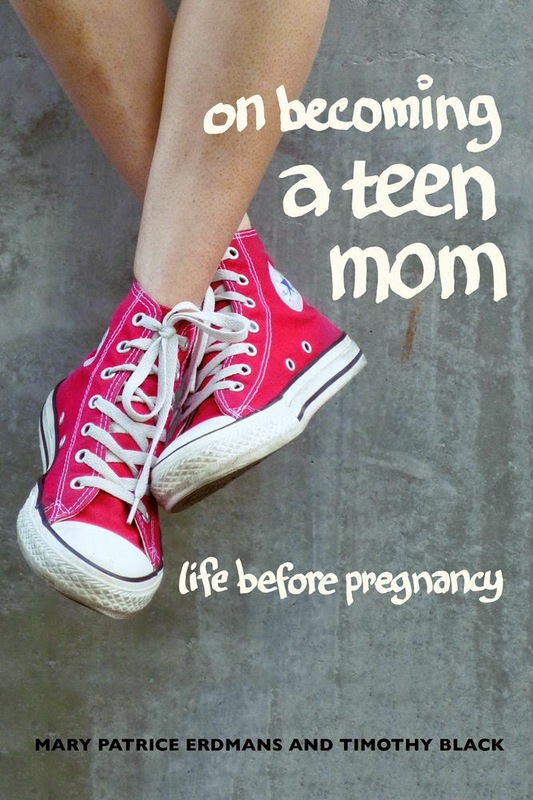 Learn more about On Becoming a Teen Mom at the University of California Press website.